I finished it up within 24 hours of my last post. Where have I been since then? Wallowing in post-project ennui. Knitting socks for Elder Daughter. Treating myself to a flat Millennium Frame for the next stitched project, which being silk, is not a good candidate for a round frame. Working on a lecture on embroidery patterns, to be given at the Hrim Schola XVI (also here)– an SCA event focused on sharing learning about needlework, to be held on 17 March. Working on TNCM2, which now looks to be topping out at 60 plates of source-annotated historical patterns, more or less. Handling work deadlines. Shuttling said Elder Daughter back to college, and Younger Daughter to fencing class. Mocking The Resident Male for being a latecomer to blogging. The usual. On a more serious note, I am also preparing to take down wiseNeedle. Some of the content will be salvaged and re-offered, like the patterns and the glossary. But the rest won’t be. Why do this after a on-the-Web run dating back to 1995? Mostly economics. I’ve supported the thing out of my own pocket since the beginning. It wasn’t cheap because we need a commercial grade SQL service to support the yarn review collection, plus incorporation to protect family assets from potential suits by folks upset by yarn review content. Ad revenue made it a business, and taxes on that tiny income stream had to be handled, too. Thanks to the advertising, wiseNeedle broke even for several years, but no longer. Yarndex made a slight dent in readership, but our independent non-sponsored stance preserved interest. Folk knew that when they saw wiseNeedle reviews posted, the information was all-volunteer and totally unsponsored. But when Ravelry broke loose, traffic here nosedived and never recovered. It’s now at about 8 percent of what it was back then. They now take up the lion’s share of knitting traffic on the Web, with their own advice boards and yarn review collection. It’s clear that concerns beyond the hobbyist level – small time independents like wiseNeedle no longer have a place on the ‘Net. Ravelry as a newly minted 500-pound gorilla, wins. String and its URL will continue although we will be porting it to a lower cost service later this year. I am hoping to preserve String’s back content, but I’m not sure how to handle wiseNeedle’s sublinks. All of those (plus String’s) may break. It’s a shame that the yarn review back catalog of info will be lost. It covers lots of yarns dating back through time and is still a valuable resource for people looking to make substitutions. Unless there’s an entity interested in buying and hosting the database (sans contributors addresses, to preserve their anonymity), it will be going away soon. Rebecca notes that the patterns in the on-line repros of antique knitting and crochet books that I reported on yesterday call for needles specified by outmoded sizing systems, and asks for help in translating those sizes to modern ones. I reply that there several sources for info on knitting from these older patterns floating around the Web. Here are a couple. The most complete size comparison chart I know about that shows older vs. modern needle sizes is at Lois Baker’s Fiber Gypsy website. I’ve also got one here at String that speaks to the equivalents between historical and modern needle sizes. I add some common vintage yarns typically used with those needle sizes along with suggestions for equivalent modern yarns (I’ll be updating this soon based on the new info from yesterday’s books). 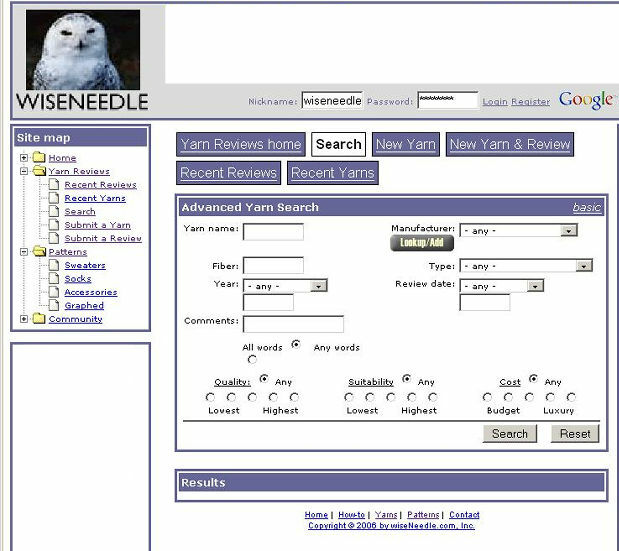 The yarn database here at wiseNeedle can be helpful, too. We’ve got a smattering of reviews for actual vintage yarns have entered by knitters who stumbled across older products in stashes or yard sales (reviews of discontinued yarns are always welcome here!). Other people have posted reviews noting that they have used various modern products as substitutes for now discontinued yarns. You can find the former by looking up the old yarn name like you would any modern one. You can also use the search comments field on our advanced search page to look for mention of an older yarn in any review. If you’ve got a yarn review to add, the most efficient way to do it is to first look up the name and see if it’s in the collection. If it is – click on the link on the yarn’s page to add your comments. Or if the yarn is new to our collection, here’s a page where you can add both basic data and your comments at the same time. The knitting terms glossary also maintained here at wiseNeedle contains historical British and American usages as well as modern ones. You can limit the result to two or more languages by holding down your <CTRL> key and highlighting the desired ones from the drop-down list. We here at String or Nothing are getting hammered by spam trackback requests. We are turning off the trackback feature in its entirety until this wave of annoyance has passed. Since we get almost no legitimate trackbacks, this shouldn’t be much of an inconvenience to the few readers here. Apologies if it is. A couple items from my inbox. 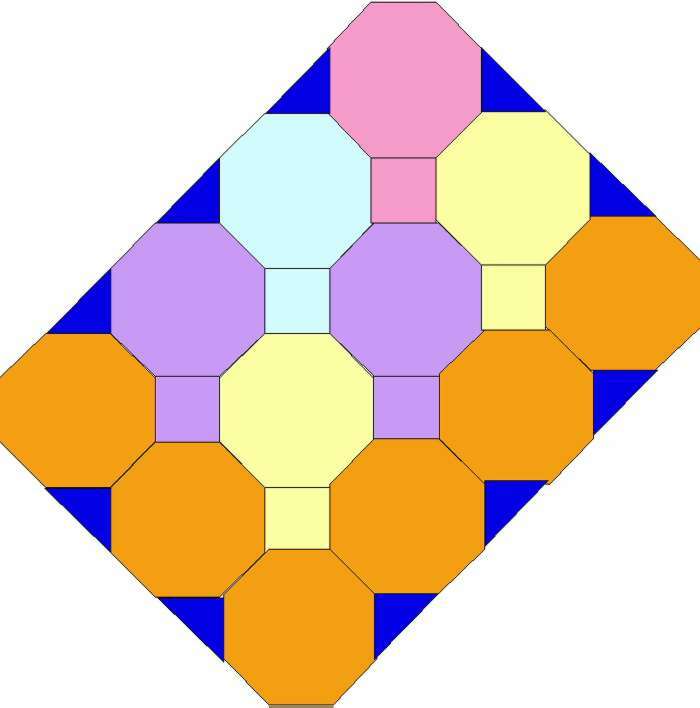 I did not use additional triangles at the corners to make a true rectangle because it’s easier to go around a more gentle angle without mitering than it is to go around a 90-degree turn. And I didn’t want to go through the bother of mitering my corners. 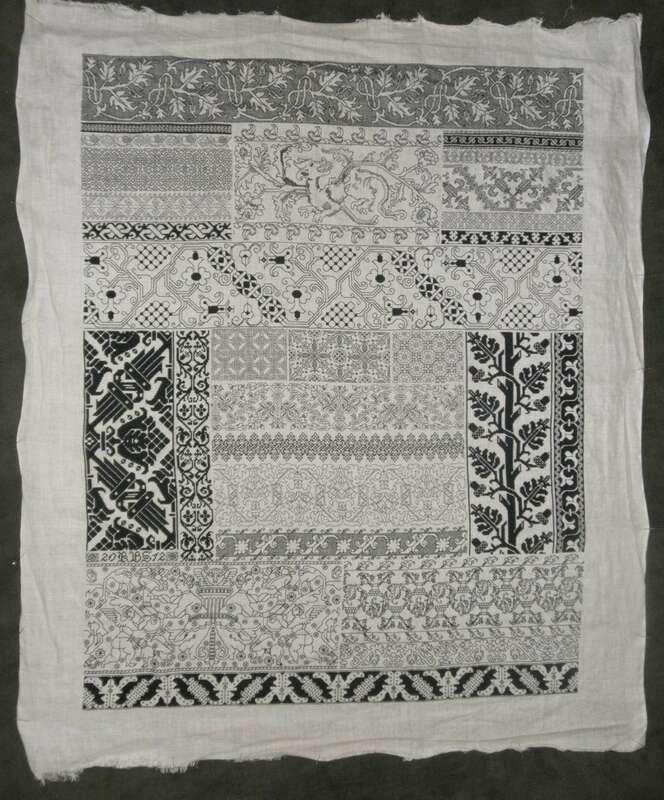 In any case, some basic guidelines for knitting and seaming together pieced counterpanes include binding the motifs off especially loosely; blocking the units before assembly, by wetting them down and pinning them out while stretching them to their maximum extent; and using whip stitch or when possible, mattress stitch done in half of the edge most stitch to sew them together. Back stitch or mattress stitch done further into the motifs will make the seams too dense and rigid, and may introduce cupping. Rachel and I had an eMail chat recently. I think it was over on one of the knitting-related boards at Live Journal. She was looking for advice on blocking. In specific, she was looking for low-cost alternatives for blocking. We went through the standards – pinning out on carpet covered with towels or on a padded table or bed, but she wanted a rigid surface that was easy to stow in addition to being inexpensive. I recommended getting a half-sheet of drywall from the hardware store, taped around the edges to reduce crumble, and topped with a flat sheet through which the pinning happens. I also suggested scouring yard sales or opportunity shops for the squishy/spongy foam pattern/alphabet block floor tiles or play mats favored by the parents of toddlers. They’re indestructible and often outlast the toddler years, landing at second-hand venues. Top those with a sheet and pin away, happy that you’ve found a modular, easy to store solution that as a creative recycle, nibbles away at the waste stream. (Photo is hers, used with permission). She also notes that she got her mat at WalMart, and it was less than $20. Love the shawl, Rachel, and as ever – I’m delighted to have been useful. First off, I want to warn and/or reassure everyone that there is no actual content anywhere on this site that relates to today’s subject line. That line is however one of the many Google search topics that have landed people at this site. I’ve got several visitor statistics compilation tools attached to wiseNeedle. Some come as part of the hosting service package provided by the website ISP, some came with the dasBlog software The Resident Male used to build this new home for String. Between them they provide an interesting profile of visitors here, including some of the stranger ways they arrived. Now I can’t see from where exactly any one query originates, so please don’t worry that I know the topic above emanated from your individual computer or account. But I can see that someone on one particular day went to Google, typed in that phrase and wound up here. Why? Because that person did a search that turned up pages that listed one or more of the words in that phrase. Knit I’ve got. Angora, too. It’s even possible that on the day in question, I mentioned work on the ribbed cuffs of an ongoing project. That’s three out of four hits on the admittedly unusual search phrase, so the seeker saw a listing for this site near the top of the probability of relevance sorted results page. (There are lots of ways to avoid this problem by targeting your searches with more precision. Google’s own tutorials are a good place to start). Still, the search and visitor logs can be fascinating. I’ve seen a recent surge in traffic from Japan. Apparently the Kureopatora’s Snake Scarf has hit mini-fad status over there. I can even trace some referrals back to sites that show pictures of newly accomplished snakes nestled in pages full of text I haven’t a hope of reading. (Translation software helps some, but not much). My conclusion from all this – Knitters are looking for lots of information. And some of them lead far more exotic lives than mine. 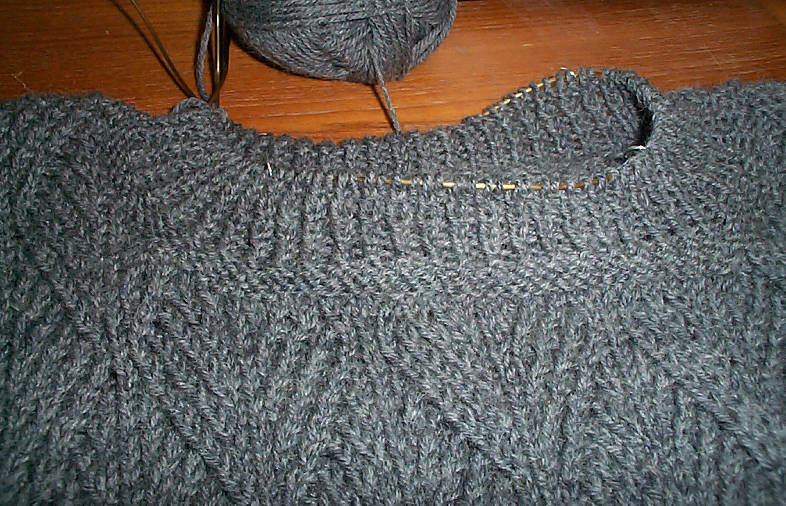 On my own knitting – I’m not quite surfaced from deadline hell. I’ve had just enough spare time to tend to processing in yarn reviews and answering advice board questions. I have an inbox full of personal notes to answer, plus a couple of questions to answer that appeared here as String comments. Apologies to everyone who has waited so patiently, wondering if I’d fallen off the edge of the world. I’m still clinging on, and hope to climb back fully by the weekend. First, welcome to the new influx of visitors here from Japan. Apparently the Kureopatora Snake Scarf has attracted attention way over there. It’s fun to see it blogged about so far from home, and in a language I can only barely read with Google tools. Where do visitors to wiseNeedle and String come from? It’s no surprise that they are overwhelmingly from the US and Canada. Japan, Australia, China, the Ukraine, Brazil, and the UK. Germany, France, and Sweden usually are in or not far from my the 10. There’s usually a good sprinkling of people wandering through from non English speaking countries aside from those on the top 10. (I think that most come to use the knitting terms glossary.) I have often been amused to see reports of visitors from some of the less frequently seen countries on my list. Sometimes there’s a small spike from an unlikely place. For example, in addition to the large number of visits from Japan last week (not uncommon at all), I had a small jump up each from Senegal and Mauritius. Whether that represents one person visiting multiple times, or one person sending links to friends, I haven’t a clue. But I do wonder what they’re knitting. There’s a lot of edging to knit when you make something like the Wave scarf. That affords ample time for a mix of boredom and the anticipation of finally finishing to set in. I don’t know about you, but when I knit something interminable I develop irrational likes and dislikes along the way. There are rows I look forward to, and rows I detest. While on some patterns the single row with a particularly awkward stitch combo (like a P2tog-back) can inspire discomfort, even dread of a tricky row, in other patterns the development of my preference makes no sense at all. For example, in this edging some rows have a bit more stockinette, but no row in particular stands out as being harder than the others, and all patterned rows have a semi-awkward K3tog. But I have a clear favorite – row 5, and a clear least favorite – row 9. I will go so far as to either get ready to do my favorite row or “get over the hump” and complete my least favorite row before setting the work down. I have irrational preferences about other bits of knitting, too. I detest sleeves. I don’t care how large or small they are, whether they’re done first or last, or if I’m working them side by side, or one at a time. I flat out hate ’em. Also buttonhole bands – especially the kind that are cast on with the regular width of the front, then placed on holders to be knit separately using a smaller needle, then sewn to the cardigan body. I know why some designers choose to do this, and I acknowledge that doing it can make neater, less “loving hands at home” looking garments – but I resent doing it. On the other hand, I don’t mind winding skeins into balls. Some of my knitpals hate that part. While I wouldn’t make wool-winding my only hobby, I don’t mind doing it in the least, and except for the largest skeins of lace weight, usually do it by hand (sometimes assisted by a swift). I rarely haul out the ball winder. Then there’s the foot part of every sock. The ankle bears a pattern or something of interest. But I don’t like wearing patterned knitting inside my shoes, and invariably knit my foot parts totally unadorned. I hate that part enough that it has shaped the entire way I knit socks. I do toe ups not because I want to avoid grafting, or that I think they fit the best (the fit well enough on me), but because doing so puts the chore before the fun. If I didn’t do those boring feet first, I’d never finish a sock. And I vastly prefer lacy knitting to lace knitting. It seems I need to decompress with a plain or low-featured row in between more intensively patterned ones. I get annoyed or quickly frustrated by patterns that include massive amounts of increases and decreases on every row. Collars? Did I mention collars? For me they’ve always been a challenge. I melt with envy when I see something like the bottom right hand picture here. In this case, the dislike is more understandable. We all dread showing our weaknesses. So. How irrational are you? Do you share my odd likes and dislikes, or are you bound by an entirely different set of your own? I’ve gotten some more questions about wiseNeedle and the yarn review collection, so I’ll take some space here to clarify what it’s all about. 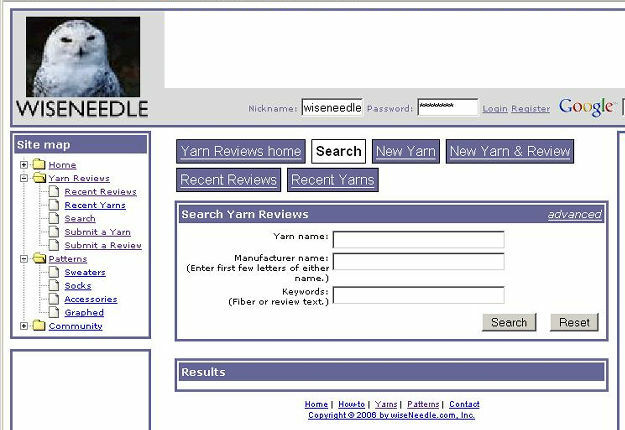 The on-line yarn review collection hosted elsewhere on this site is the latest manifestation of a project I’ve kept going since 1994/1995. Back in the early days of the KnitList mailing list, (when there were fewer than 250 members) yarns would come up for discussion. Opinions and gauges achieved would be shared. Then a couple of weeks later the whole thread would be repeated because someone had another question or a new person had joined with similar questions. So I began asking people to “donate” their comments to a central list to preserve valuable info and cut down on repetition. My list started out as a text file that we shared round-robin. In 1995 I posted that content on my first web site, in the form of one and later a series of interconnected static web pages. It grew to the point of unmanageability. The Resident Male saw a challenge, and volunteered to build the necessary infrastructure to make the thing into a fully searchable database with a web front end open for (vetted) public contribution. So in 2000 we did. Since then the yarn review collection has grown to include basic data for over 5225 yarns, the names of over 490 yarn makers, and to contain over 2875 individual reviews from over 2000 knitters, worldwide. We have info on both current and discontinued yarns (very useful if you have an older pattern or yarn you wish to find substitutes for) as well as products off the beaten track or only regionally available. Aside from my looking over reviews to make sure they’re attached to the intended product, that products are not duplicated without need, and that comments are not blatant planted ads or spam/graffiti, there’s no censorship or editing of anything posted. And it’s just me (plus The Resident Male as resident technical wizard). There’s no other staff here, nor is there a group of captive volunteers assigning yarns to be reviewed or performing assessments. I’m afraid that we can’t respond to requests to see reviews posted for specific products. We have to sit and wait for someone who has used a yarn to post a review. We have absolutely no involvement with yarn makers, sellers, or distributors and do not rely on them for subsidies or placement income. Nor do we accept samples or other marketing-related inducements. Therefore you are not going to see breathless endorsements of whatever the latest fad is, posted prior to a yarn’s wide availability. Nor do we remove negative reviews because we fear a loss of relationship with a sponsoring vendor or diminution of click-through or ad revenue from retailers who are paying for the privilege of appearing on our pages (all ads that you do see are blind-placed through Google or Burst services. Income goes to defray the cost of maintaining the site without charging user fees). What you are going to see are honest opinions both negative and positive from knitters of all levels of experience from beginner to advanced. For widely used yarns, you’ll see reports of many different projects, knitted at a variety of gauges. Some will have follow-ups that report on washing or durability problems that crop up long after the actual knitting was done. And you’ll find differences of opinion, with some people loving a yarn for particular properties, and others detesting it for those same (or different) reasons. So it all adds up to this. 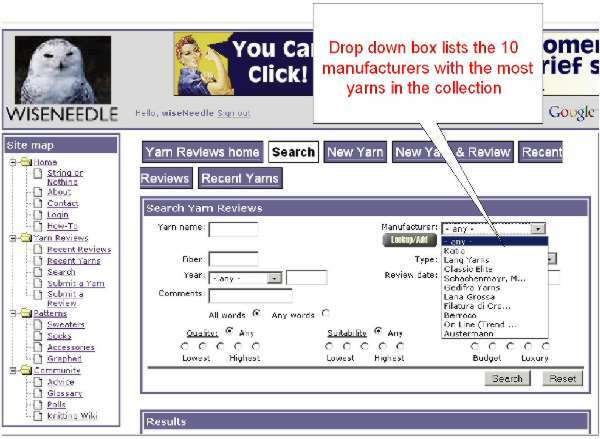 If you find an independent, central repository of this kind of info to be of any value – one which retains info long after a yarn is discontinued, is independent and impartial, and provides the forum for everyone to voice an opinion – please consider adding a review for the yarn on your needles right now to our collection. Just because someone has reviewed it before doesn’t make your experience less valuable. Your knitting experience, your project, your gauge, your care/durability experience may either confirm and strengthen group consensus about that product, or may provide a valuable point of difference. In all cases, your opinions are most welcome here. The easiest way to enter a review is to look up the yarn on the search page, then add your notes to its basic info page. With as many entries as we have, unless your yarn is very old, a small run product, or very new this season it’s likely that it’s in there. 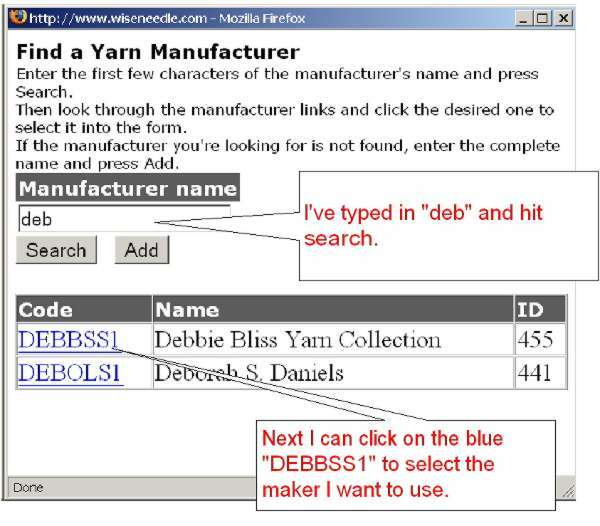 Like all databases, you need only enter the minimum info to call up an entry – usually just the first few letters of the yarn’s name, then hit search. That will bring up a list of similar entries. Click on the one you want, then on the “review this yarn” link on that basic info page. If your yarn isn’t found, there’s a handy page on which you can add both basic data and your opinion at the same time. (If your entry duplicates data for something we already have but that you weren’t able to find easily, and I can’t confirm that it’s the same I may eMail you to ask if your product is in fact something new). And there’s a page to enter basic data for yarns without adding comments, even if you’re not ready to post an opinion yet. So please consider posting an entry to the wiseNeedle yarn review collection. I can guarantee you that somewhere in the world another knitter will be grateful for your help.